The Cross Fell massif is a place of superlatives. Cross Fell itself is the highest point on the Pennines and the highest English fell outside the Lake District. It is home to the Helm Wind, the only named wind in Britain – a north-easterly that whistles down the fell side to batter the villages of the Eden Valley at the foot of the north Pennines. This föhn wind, produced as moist, cool air is forced to rise over the hills, produces a warmer, drier flow on its lee side. On Cross Fell, it is usually accompanied by a large, stagnant Helm Bar – a bank of cloud hanging over and sometimes shrouding the summit. Cross Fell’s neighbour Great Dun Fell has the highest asphalted road in England: the service road to the air-traffic radar domes, which rises to 848m (2,782ft). This walk takes in both fells, the highest and second highest on the Pennines, with smaller cousin Little Dun Fell sandwiched between them. If fatigue takes over, the route can be truncated after summiting Cross Fell by heading back to Kirkland from Crowdundle Head, omitting the section over Little Dun Fell and Great Dun Fell. Cross Fell was formerly known as Fiends’ Fell and carried an ominous reputation as a place to avoid. But its large bulk holds few nasty surprises other than an opportunity to get lost or bogged down in some of its mosses. Its top is an unremarkable place: a broad, grassy ridge with a rudimentary cross shelter, but the views are extensive. The Lakeland fells beckon to the West, the Galloway hills are plain to the North West and, to the far North, the Moffat hills can be seen. To the East, the hills of Teesdale and Weardale slope more gently away, with the northern Dales fells prominent beyond Great Dun Fell to the South. 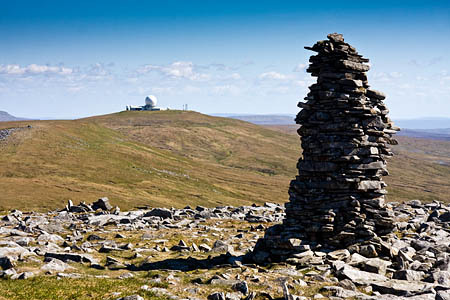 So Cross Fell is best ascended on a clear day, when its views are extensive and remarkable. The route starts in Kirkland, where there is some roadside parking. Take the track past Kirkland Hall, which soon enters open countryside. The old corpse road curves left under the fell of High Cap on the right, gently rising into the gill of Ardale towards the crags of Black Doors. Anyone familiar with High Cup, 10km (6 miles) south-east, will recognise the geology of Black Doors, an outcropping of the volcanic Whin Sill rocks, the 295-million-year-old dolerite, formed by magma injected into the existing limestone. The track zigzags through old mine workings before it heads left sharply. At the point where it turns, take the footpath off to the right, leading straight up the hillside and across a boggy section to the col at the Yad Stone. 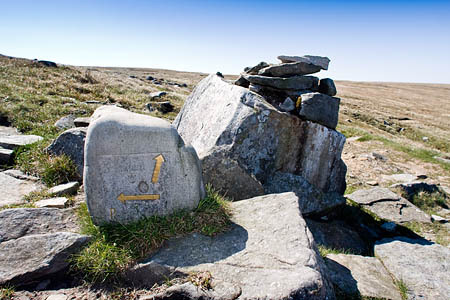 At some tumbledown curricks – shepherds’ shelters – an easy-to-miss marker, facing east, directs walkers right, up the Pennine Way and up the final slope on to Cross Fell’s wide summit plateau. 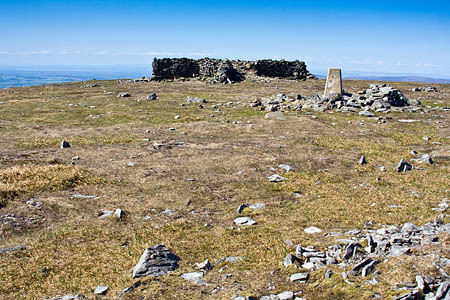 A succession of cairns mark the way to the cross shelter, a few metres from the fell’s trig point at 893m (2,930ft). The white radar dome of Great Dun Fell also hoves into view and it’s time to enjoy the extensive views, unless of course the Helm Bar is down. Head south-eastwards along the Pennine Way from the trig, heading for the cairn on the edge of the plateau. From there, the path drops to the col at Crowdundle Head, a true watershed, with the nascent Tees to the left and a tributary of the westward-bound River Eden to the right. Look out for a carved stone in the ground, before the old boundary fence. 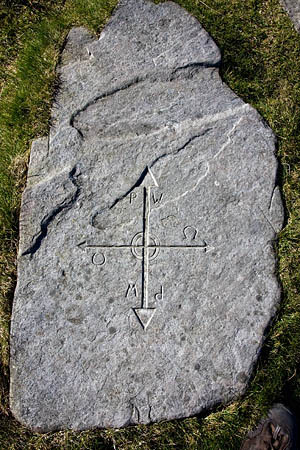 The stone is neatly carved with a double arrow denoting the direction of the Pennine Way and, at right angles to it a path marked oddly with the omega symbol. The westwards path from here will be our return route to the Eden valley after visiting the Duns. If the legs are giving out, or daylight is in short supply, turn right here and follow the route down the northern flank of Greatdale. This is the old county boundary where Cumberland, in which we have been walking, met Westmorland, in which the Duns lie. Both have now been subsumed into the modern county of Cumbria. Those with a few joules of energy left in their legs should carry straight ahead, up the part-paved slope of Little Dun Fell. A tumbledown shelter adorns the summit. Carry on still south-eastwards towards the National Air Traffic Services radar installation. 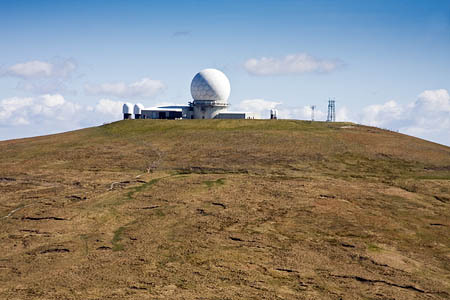 The Pennine Way is flagged underfoot for all but the last few hundred metres and veers to the left of the perimeter fence of the radar station, which has one large ‘golf ball’ and four smaller domes, along with a plethora of antennae, masts and other very technical looking electronic gizmos. It also has an automatic weather station, so when you get back, you can check how windy it was. On the day of our visit, the wind was consistently at more than 80kph, gusting at times to 100kph – a bit breezy! Retrace your steps over Little Dun Fell to find the stone above the col at Crowdundle Head, then turn left along a very indistinct and boggy path initially, which becomes more defined but not much less boggy. The descent, on the north of the large gill containing Crowdundle Beck, emphasises the bulk of Cross Fell, and seems longer than the ascent. Curve around the limestone outcrops of Wildboar Scar – nowhere as exciting as its name suggests – and then drop down to meet a walled section with lots of gorse bushes. The pyramid shapes of Knock Pike and Dufton Pike are seen to advantage to the South. 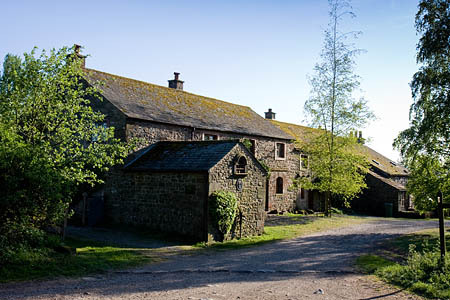 Turn right through the gate into the farmyard at Wythwaite, then follow a track to Ranbeck, shortly before which the lynchets with the grand name of the Hanging Walls of Mark Anthony can be seen on the far side of the beck. There has been much conjecture about the age and significance of these cultivation terraces. Their impressive name suggests an age of around 2,000 years, but some have suggested they are more recent. Even Ordnance Survey can’t seem to make up its mind, the name denoting a Roman antiquity, the description cultivation terraces in a typeface suggesting a non-Roman feature. There is certainly no evidence that Cleopatra’s bisexual lover ever tended crops in the Eden Valley, nor even graced the shores of Britain, but the name remains, along with its mystery. A path leaves the track at Ranbeck and leads behind the farm buildings before crossing several fields before arriving back at the track near Kirkland Hall. Ordnance Survey mapping and route data for this walk can be found on our grough route system. Key in Cross Fell to the keyword search. Thank you for posting this walk. Really descriptive and full of facts! Sounds like it was a little breezy on the day, according to the weather station! Nice walk, well described. But it's a Helm Cap that will hide the Radome. The Helm Bar will be about 4 miles due west of the summit. This is a really great walk, I was just up there recently. Even better if you start by cycling from Kirkland to Knock or Dufton, leave the bike there and take in more of the ridge. Then collect bike with the car afterwards.